Covenant Relationships: Married to Mrs. Right? You still have to work at your marriage. Most men are not the "Always-be-right" type. Neither are most women. But people of this type, in my experience, tend not to realize they do it, nor realize the damage it does in their relationships. It's more a certain personality type. These are the people who, even when proven wrong, will twist the situation in such a way as to show that the other person was wrong as well. They often (especially when young) do not realize that they aren't really winning arguments - people around them are humoring them and stopping the conversation, not actually changing their minds. Living with an always-be-right type can be annoying and lonely, because you can't discuss anything without the meta-issue of "who's in the wrong here"? hanging over everything. They are like a sort of "accuracy police". 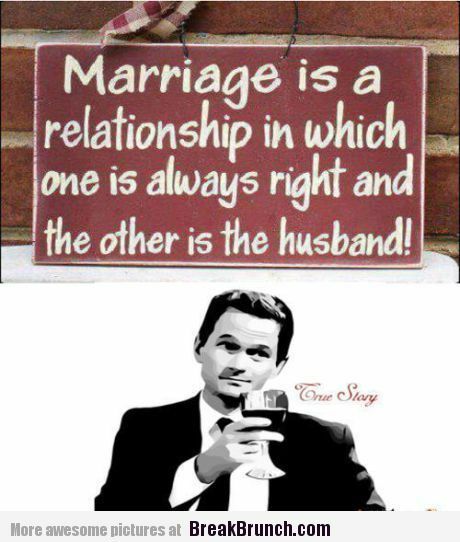 On the bright side, a lot of the "wife is always right" generally depends on how "right" the wife is over time. If a husband can't trust the wife's decisions then every little thing has to be evaluated, and honestly, that's just exhausting and the same goes for women when relying on their husbands for certain decisions. I suspect that that the view of "just tell her she is right" is held by husbands who don't want to take the time to actually work things out with their wives. All that communication stuff is for chicks, they think, better to tell her she's right so they can go back to the AFCON finals. In my observation I have found that both men and women, don't communicate very well. They don't express themselves well, and they don't listen to or understand others well. This leads to things like women saying "Oh, I don't mind if you go out with your friends" when really they should have said "I'm lonely when you go out with your friends, would you please watch a movie with me?". Then the guy hears "I don't mind if you go" and doesn't notice that she also said "It would be nice if you were back before 8 pm so we could do xyz" and that causes a problem. Men and women tend to have different styles of verbal communication so that often they are talking past each other. It takes a concerted effort for couples to communicate well, and frankly a lot of people are lazy and don't want to put forth the effort. So what if it's pointless that the wife insists on painting the walls red and white instead of cream. That doesn't make her "wrong" and you don't need to win an argument about that. Perhaps that's what some of the guys mean when they say "just give in, tell her she is right". If a man wants something a certain way just because he wants it, he should say so and tell his wife it's not because her ideas aren't important instead of trying to pose an obviously self-serving factual argument. Women can easily detect that, and it's insulting. Finally, As long as you both share the same core values the rest should not be blown out of proportion. You have a great wife, a job, a home... do you love every color on every wall in the house? No. Does your wife like all of your hobbies and habits? No. You bend on the small stuff and work together to resolve the big stuff. What makes marriage work by putting the needs of the other before your own...like Jesus did for the church. When you have two people who work together at their marriage, it forms such a bond of strength, friendship, love, and trust... And it is so worth it. This is just the absolute truth. This is so true....I am learning to "Just Say It"!cos wen I really want something I hope He takes a cue wen truly men are so not wired that way.The number 1 characteristic of a great wife is ur ability to defer to THE BOSS,hence,I v this automated submit to ur husband thing @ the front of my head,if ever there's any such! The "I don't mind hanging wit Ur friends..." is ssoooooo apt,let's just say women are literarily n figuratively the best multi-taskers ever...so we feel every other woman shud think and do the needful! Truth is Marriage as to our very existence is a work in progress...We v got to keep giving the best of our selves!!! Thank you Solomon and Frodo for your comments.LOL @ defer to the boss. Yes, "we've got to keep giving the best of ourselves!"